Ride in Comfort, Style and Elegance. We offer a range of genuine Dutch Classic Bikes. 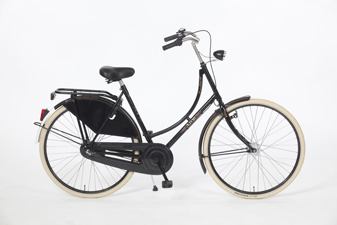 These Dutchbikes are from timeless designs and are produced using top quality materials. The paint work is powder-coat and the components provide the latest technology in gears, brakes and accessories. For all frame sizes the wheels are common at 28” which gives that easy rolling relaxed ride characteristic of Dutchbikes. The upright riding position means freedom from wrist and back pain. Dutch bikes are renowned for their reliability and durability - with gears and chain enclosed the need for maintainance is kept to a minimum. With optional puncture resistant tyres you'll spend more time on the road and less time in the repair shop. All Dutchbikes come fully equipped with lighting and in most cases you can opt for a smooth running hub dynamo with automatically switched light units.